Performance verification is a step which has regularly been employed in space missions to assess and qualify the scientific capabilities of an instrument. Within this framework, it was the goal of the Science Verification program to submit the VLT Unit Telescope No. 1 (UT1) to the scrutiny that can only be achieved in an actual attempt to produce scientifically valuable results. To this end, an attractive and diversified set of observations were planned in advance to be executed at the VLT. These Science Verification observations at VLT UT1 took place as planned in the period from August 17 to September 1, 1998, cf. the September issue of the ESO Messenger (No. 93, p.1) and eso9812 for all details. Although the meteorological conditions on Paranal were definitely below average, the telescope worked with spectacular efficiency and performance throughout the entire period, and very valuable data were gathered. After completion of all observations, the Science Verification Team started to prepare all of the datasets for the public release that took place on October 2, 1998. 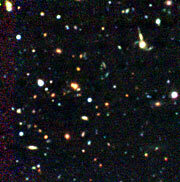 The data related to the Hubble Deep Field South (now extensively observed by the Hubble Space Telescope) were made public world-wide, while the release of other data was restricted to ESO member states. With this public release ESO intended to achieve two specific goals: offer to the scientific community an early opportunity to work on valuable VLT data, and in the meantime submit the VLT to the widest possible scrutiny. With the public release, many scientists started to analyse scientifically the VLT data, and the following few examples of research programmes are meant to give a sample of the work that has been carried out on the Science Verification data during the past two months. They represent typical investigations that will be carried out in the future with the VLT. Many of these will be directed towards the distant universe, in order to gather insight on the formation and evolution of galaxies, galaxy clusters, and large scale structure. Others will concentrate on more nearby objects, including stars and nebulae in the Milky Way galaxy, and some will attempt to study our own solar system. The following six research programmes were presented at the Press Conference that took place at the ESO Headquarters in Garching (Germany) today. The goal of this programme was to verify the capability of the VLT by obtaining the deepest possible ground-based images and using multicolour information to derive the redshifts (and hence the distances) of the faintest galaxies. The space distribution, luminosity and colour of these extreme objects may provide crucial information on the initial phases of the evolution of the universe. The method is known as photometric redshift determination. 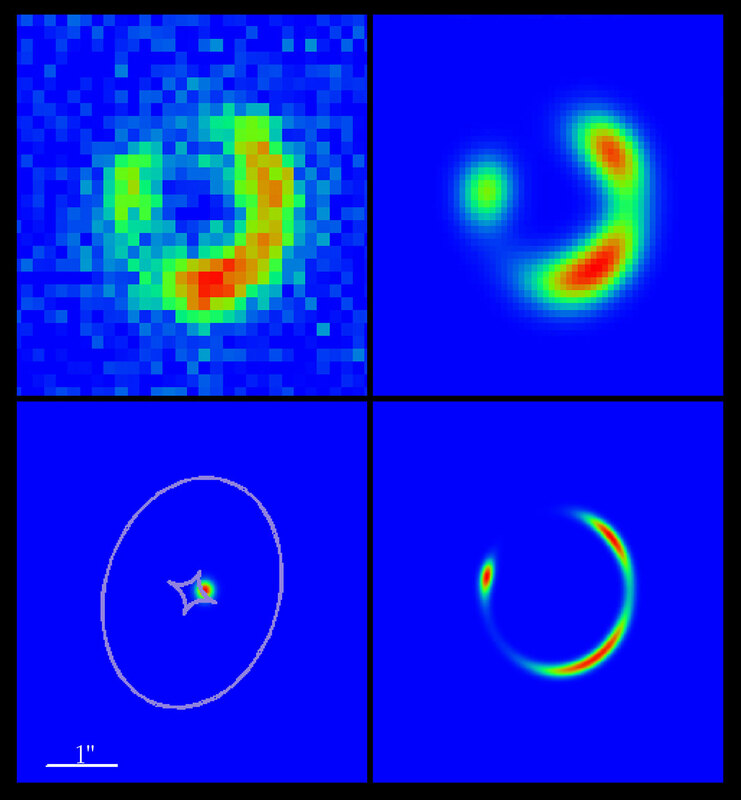 The VLT Test Camera was used to collect CCD images for a total of 16.6 hours in five spectral filters (U, B, V, R and I) in the so-called HDF-S NIC3 field. This is a small area (about 1 arcmin square) of the southern sky where very deep observations in the infrared bands J, H and K (1.1, 1.6 and 2.2µm, respectively) have been obtained by the Hubble Space Telescope (HST). 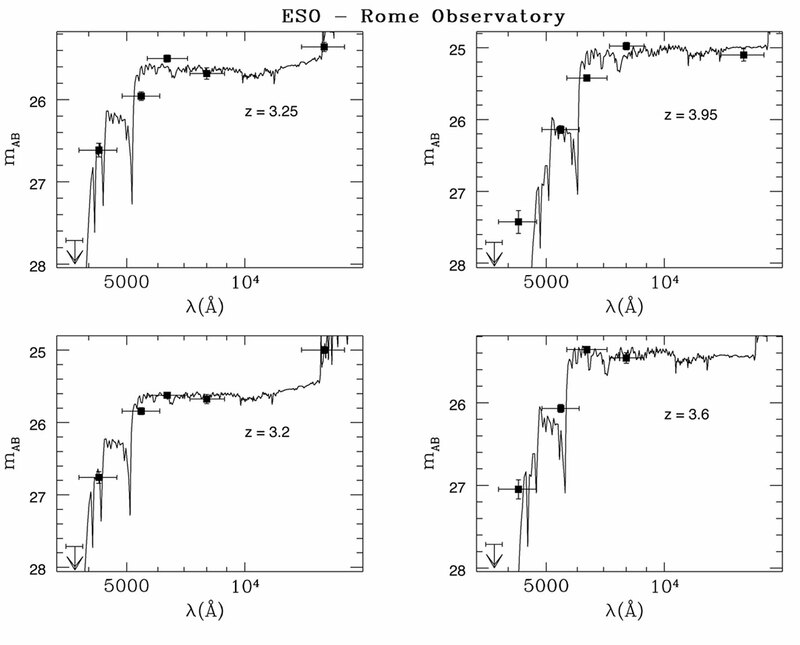 The observations were combined and analyzed by a team of astronomers at ESO and the Observatory of Rome (Italy). Galaxies were detected in the field down to magnitude ~ 27-28. In most colours, the planned limiting values of the fluxes were successfully reached. For most of these very faint sources, it is not possible to collect enough photons to measure the recession velocity (the redshift) by spectroscopy, even with an 8-m telescope. The redshifts and the main galaxy properties are then determined by comparing the colour observations with synthetic spectra. This has been done for more than one hundred galaxies in the field brighter than magnitude 26.5. Around 20 are found to be at redshifts larger than 2. The brighter ones are excellent candidates for future detailed studies with the UT1 instruments FORS1 and ISAAC. The scientists involved in this study are: Sandro D'Odorico, Richard Hook, Alvio Renzini, Piero Rosati, Rodolfo Viezzer (ESO) and Adriano Fontana, Emanuele Giallongo, Francesco Poli (Rome Observatory, Italy). Because the gravitational pull of matter bends the path of light rays, astronomical objects - stars, galaxies and galaxy clusters - can act like lenses, which magnify and severely distort the images of galaxies behind them, producing weird pictures as in a hall of mirrors. In the most extreme case, where the foreground lensing galaxy and the background galaxy are perfectly lined up, the image of the background galaxy is stretched into a ring. Such an image is known as an Einstein ring , because the correct formula for the bending of light was first described by the famous phycisist Albert Einstein . The picture shows a new, true colour image of an Einstein ring, first discovered at ESO in 1995. The ring, which is the stretched image of a galaxy far out in the Universe, stands out clearly in green, and the red galaxy inside the ring is the lens. The discovery image was very faint, but this new picture, taken with the VLT during the Science Verification Programme allows a much clearer view of the ring because of the great light-gathering capacity the telescope and, not least, because of the superb image quality. Gravitational lensing provides a very useful tool with which to study the Universe. As "weighing scales", it provides a measure of the mass within the lensing body, and as a "magnifying glass", it allows us to see details in objects which would otherwise be beyond the reach of current telescopes. This new detailed picture has allowed a much more accurate measurement of the mass of the lensing galaxy, revealing the presence of vast quantities of "unseen" matter, five times more than if just the light from the galaxy is taken into account. This additional material represents some of the Universe's dark matter . The gravitational lens action is also magnifying the background object by a factor of ten, providing an unparalleled view of this very distant galaxy which is in a stage of active star-formation. The scientists involved in this study are : Palle Møller (ESO), Stephen J. Warren (Blackett Laboratory, Imperial College, UK), Paul C. Hewett (Institute of Astronomy, Cambridge, UK) and Geraint F. Lewis (Dept. of Physics and Astronomy, University of Victoria, Canada). One of the main goals of modern cosmology is to understand when and how the galaxies formed. In the very last years, many high-redshift (i.e. very distant) galaxies have been found, suggesting that some galaxies were already assembled, when the Universe was much younger than now. None of these high-redshift galaxies have ever been found to be a bona-fide red elliptical galaxy . The VLT, however, with its very good capabilities for infrared observations, is an ideal instrument to investigate when and how the red elliptical galaxies formed. The VLT Science Verification images have provided unique multicolour information about an extremely red galaxy that was originally (Treu et al., 1998, A&A Letters, Vol. 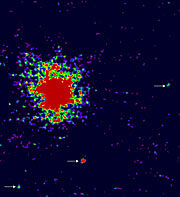 340, p. 10) identified on the Hubble Deep Field South (HDF-S) Test Image. 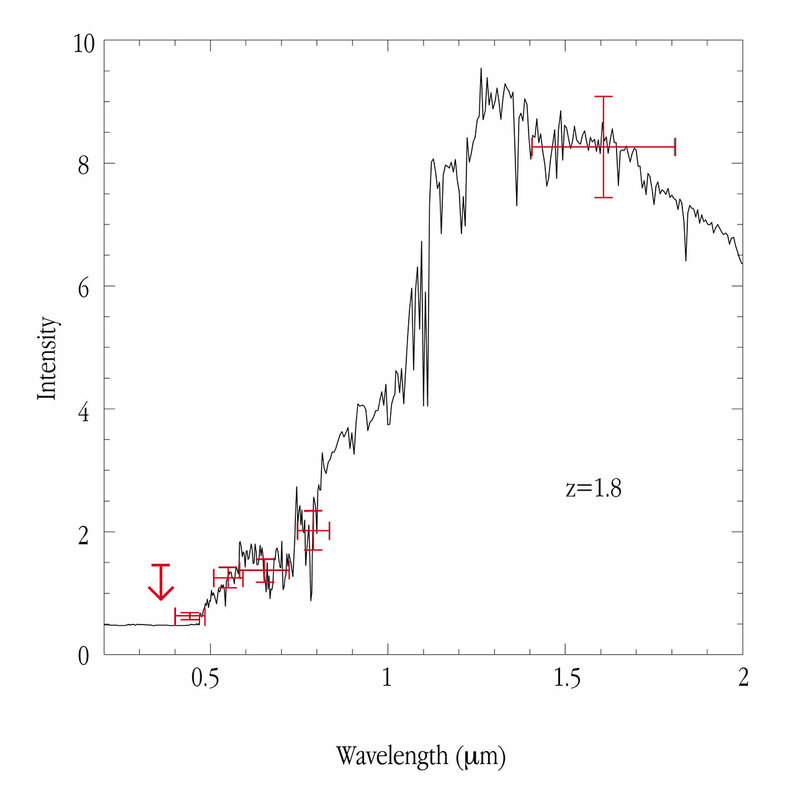 It was detected on Near-IR images and also on images obtained in the optical part of the spectrum, at the very faint limit of magnitude B ~ 29 in the blue. However, this galaxy has not been detected in the near-ultraviolet band. The colours measured at the VLT and on the HST Test Image are very well matched by those of an old elliptical galaxy at redshift z ~ 1.8 ; see ESO Press Photo eso9858 . All the available evidence is thus consistent with this object being an elliptical galaxy with the highest-known redshift for this galaxy type. A preliminary analysis of Hubble Deep Field South data, just released, seems to support this hypothesis. If these conclusions are confirmed by direct measurement of its spectrum, this galaxy must already have been "old" (i.e. significantly evolved) when the Universe had an age of only about one fifth of its present value. A spectroscopic confirmation is still outstanding, but is now possible with the ISAAC instrument at VLT UT1. A positive result would demonstrate that elliptical galaxies can form very early in the history of the Universe. The scientists involved in this study are: Massimo Stiavelli, Tommaso Treu (also Scuola Normale Superiore, Italy), Stefano Casertano, Mark Dickinson, Henry Ferguson, Andrew Fruchter, Crystal Martin (STSci, Baltimore, USA), Piero Rosati and Rodolfo Viezzer (ESO), Marcella Carollo (Johns Hopkins University, Baltimore, USA) and Henry Tieplitz (NASA, Goddard Space Flight Center, Greenbelt, USA). In current theories of galaxy formation, luminous galaxies we see to-day were built up through repeated merging of smaller protogalactic clumps. Quasars, prodigious sources pouring out 100 to 1000 times as much light as an entire galaxy, have been used as markers of galaxy formation activity and have guided astronomers in their hunting of primeval galaxies and large-scale structures at high redshift. A supermassive black-hole, swallowing stars, gas and dust, is thought to be the engine powering a quasar and the interaction of the galaxy hosting the black-hole with neighboring galaxies is expected to play a key role in "feeding the monster". At intermediate redshift, a large fraction of radio-loud quasars and radio galaxies inhabit rich clusters of galaxies, whereas radio-quiet quasars are rarely found in very rich environments. Furthermore, tidal interaction between quasars and their nearby companions is also the favoured explanation for the presence of large gaseous nebulosities associated with radio-loud quasars and radio galaxies. 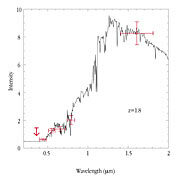 At high redshift, searches for Lyman-alpha quasar companions and emission-line nebulosities show strong similarities with those seen at lower redshift, although the detection rate is lower. A search for Lyman-alpha companions to the radio-weak quasar J2233-606 in the Hubble Deep Field South (HDF-S) was conducted during the VLT UT1 SV programme in a small field of 1.2 x 1.3 arcmin 2, centered on the quasar. Candidate Lyman-alpha companions were identified by subtracting a broad-band B (blue) image, that traces the galaxy stellar populations, from a narrow-band image, spectrally centered on the redshifted, narrow Lyman-alpha emission line of the quasar (z = 2.2). Three Lyman-alpha candidate companions were discovered at angular distances of 15 to 23 arcsec, or 200 to 300 kpc (650,000 to 1,000,000 light-years) at the distance corresponding to the quasar redshift. The emission lines are very strong, relative to the continuum emission of the galaxies - this could be a consequence of the strong ionizing radiation field of the quasar. These companions to the quasar may trace a large-scale structure which would extend over larger distances beyond the observed, small field. Even more striking is the presence of a very extended nebulosity whose size (120 kpc x 160 kpc) and Lyman-alpha luminosity (3 x 10 44 erg/cm 2 /s) are among the largest observed around radio galaxies and radio-loud quasars, but rarely seen around a radio-weak quasar. Tidal interaction between the northern, very nearby companion and the quasar is clearly present: the companion is embedded in the quasar nebulosity, most of its gas has been stripped and lies in a tail westwards of the galaxy. The scientists involved in this study are: Jacqueline Bergeron (ESO), Stefano Cristiani, Stephane Arnouts, Gianni Fasano (Padova, Italy) and Patrick Petitjean (Institut d'Astrophysique, Paris, France). During the past years, it has become possible to detect and subsequently study progressively more distant clusters of galaxies. 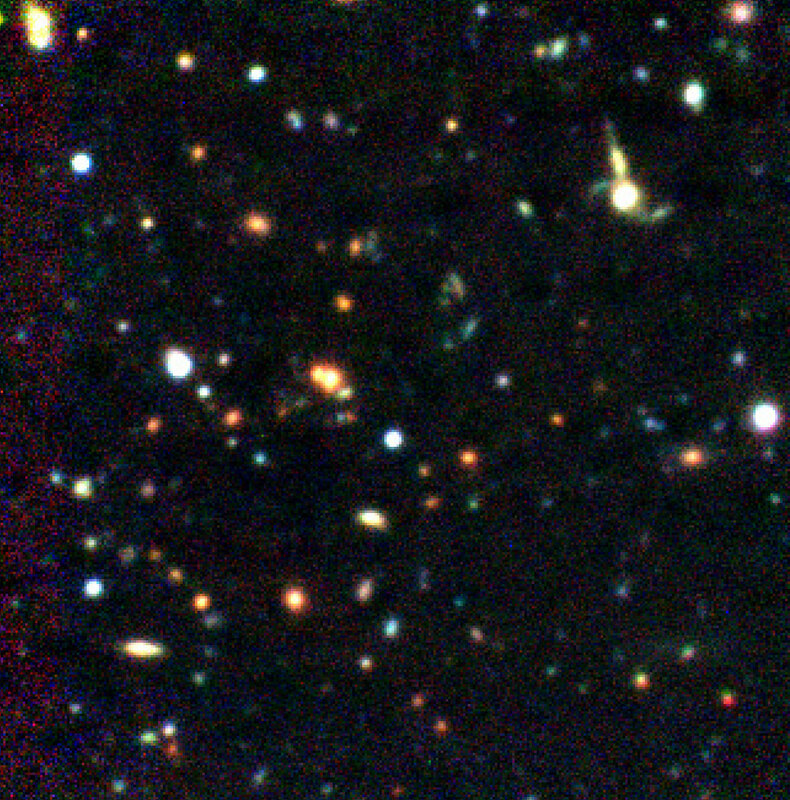 For this research programme, UT1 Science Verification data were used, in combination with data obtained with the SOFI instrument at the ESO New Technology Telescope (NTT) at La Silla, to confirm the existence of two very distant galaxy clusters at redshift z ~ 1, that had originally been detected in the ESO Imaging Survey. This redshift corresponds to an epoch when the age of the Universe was only two-thirds of the present. 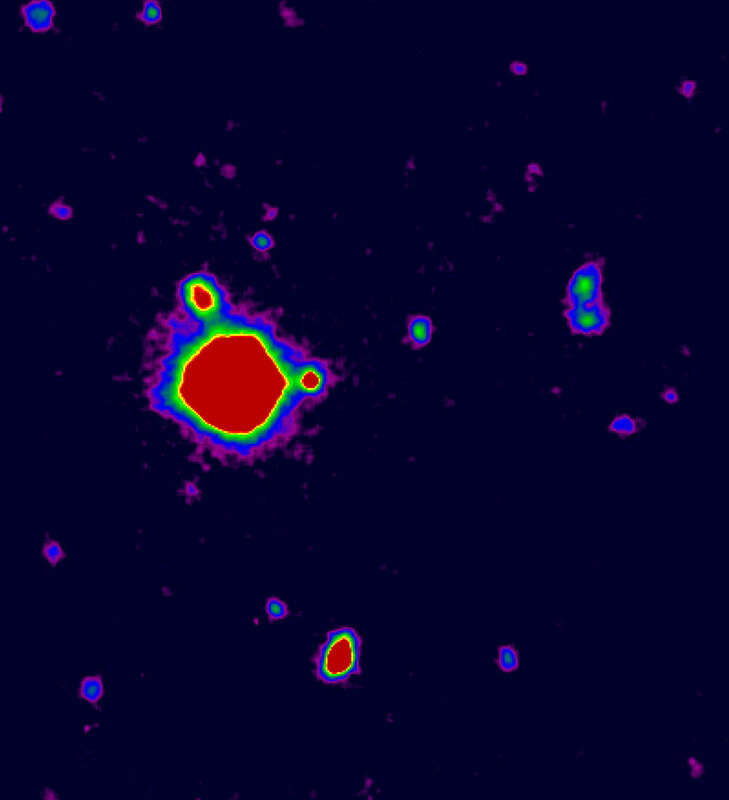 This was achieved by the detection of a spatial excess density of galaxies, with measured colour equal to that of elliptical galaxies at this redshift, as established by counts in the respective sky areas. The field of one these clusters is shown in ESO Press Photo eso9858 . These new data show that the VLT will most certainly play a major role in the studies of the cluster galaxy population in such distant systems. This will contribute to shed important new light on the evolution of galaxies. Furthermore, the VLT clearly has the potential to identify and confirm the reality of many more such clusters and thereby to increase considerably the number of known objects. This will be important in order to determine more accurate values of the basic cosmological constants, and thus for our understanding of the evolution of the Universe as a whole. The presentation was made by Lisbeth Fogh Olsen (Copenhagen Observatory, Denmark, and ESO) on behalf of the scientists involved in this study. Observations with large optical telescopes during the past years have begun to cast more light on the still very little known, distant icy planets in the outer solar system. Until November 1998, about 70 of these have been discovered outside the orbit of Neptune (between 30 and 50 AU, or 4,500 to 7,500 million km, from the Sun). They are accordingly referred to as Trans-Neptunian Objects (TNOs) . Those found so far are believed to represent the "tip of the iceberg" of a large population of such objects belonging to the so-called Kuiper Belt . This is a roughly disk-shaped region between about 50 and 120 AU (about 7,500 to 18,000 million km) from the Sun, in which remnant bodies from the formation of the solar system are thought to be present. From their measured brightness and the distance, it is found that most known TNOs have diameters of the order of a few hundred kilometres. About half of those known move in elongated Pluto-like orbits, the others move somewhat further out in stable, circular orbits. During the two-week Science Verification programme, approximately 200 minutes were spent on a small observing programme aimed at obtaining images of some TNOs in different wavebands (B, V, R and I). Since this programme was primarily designed as a back-up to be executed during less favourable atmospheric conditions, some of the observations could not be used. 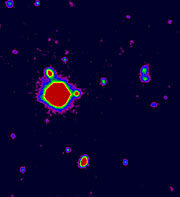 However, images of three faint TNOs were recorded during an excellent series of 1-10 min exposures. From these data, it was possible to measure quite accurate magnitudes (and thus approximate sizes) and to determine their colours. 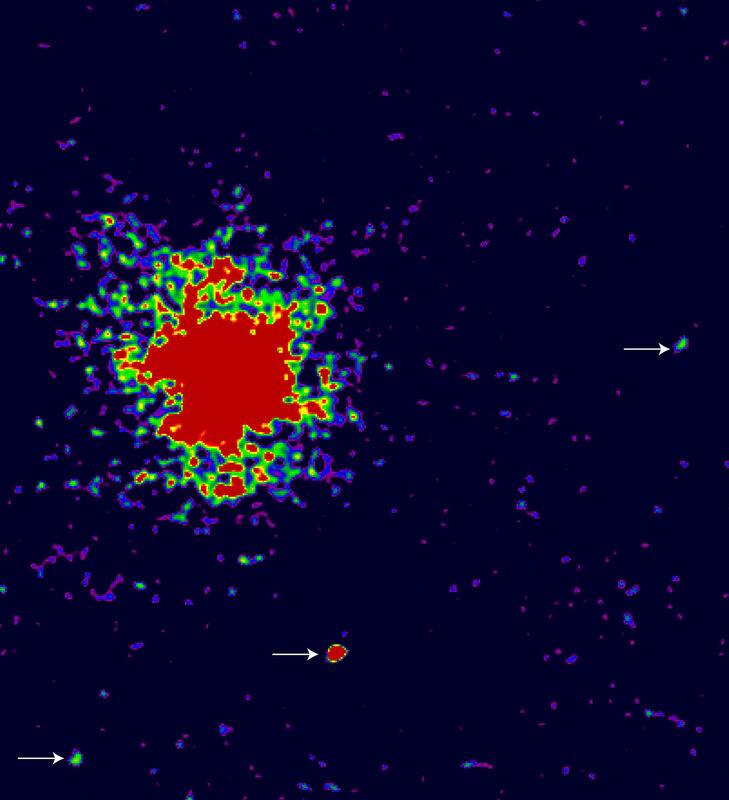 One of them, 1996 TL66, was among the bluest TNOs ever observed. It is believed that this is because its surface has undergone recent transformation, possibly due to collisions with other objects or the breaking-off of small pieces from the surface, in both cases revealing "fresh" layers below. The combination of all available exposures made it possible to look for faint and tenous atmospheres around these TNOs, but none were found. These results show that it is possible, with little effort and even under quite unfavourable observing conditions, to obtain valuable information with the VLT about icy objects in the outer solar system. Of even greater interest will be future spectroscopic observations with FORS and ISAAC that will allow to study the surface composition in some detail, with the potential of providing direct information about (nearly?) pristine material from the early phases of the solar system. The scientists involved in this study are: Olivier Hainaut, Hermann Boehnhardt, Catherine Delahodde and Richard West (ESO) and Karen Meech (Institute of Astronomy, Hawaii, USA).